One of the advantages to living in upstate NY is that, every fall, the apple trees become laden with their wonderfully tasty fruit. It’s an annual tradition of ours to go to an apple orchard and pick our own apples. They but only wind up being less expensive than store bought apples, but the kids have a blast going from tree to tree plucking the fruit themselves. A couple of weeks ago, I took the boys to Indian Ladder Farms. There we picked apples, saw some animals (some of which the boys got to pet), and has a blast. 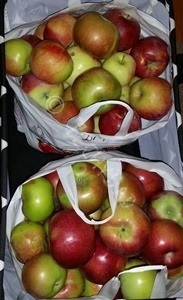 When we got home, I weighed our apple haul: 44.5 pounds. I had a taste test of the types of apples we picked and the consensus was that one of them wasn’t very good. It was way too tart to just eat. It would be, however, perfect for baking. 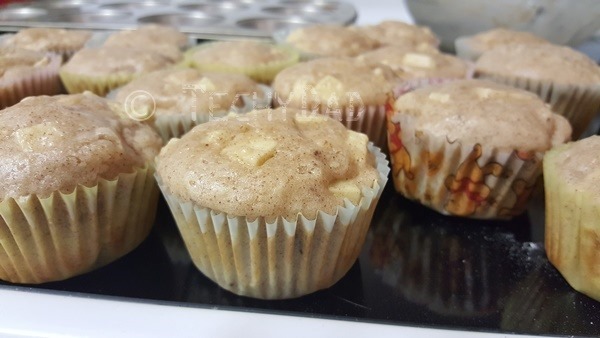 I began with some apple muffins. I figured these would be good for a breakfast or school snacks. I also thought that the 2 cups chopped apples that the recipe called for would put a nice dent in our apple supply. Imagine my shock when it only used up two apples. My apple bread recipe called for three cups of apples. Sure enough, this used up three more apples. 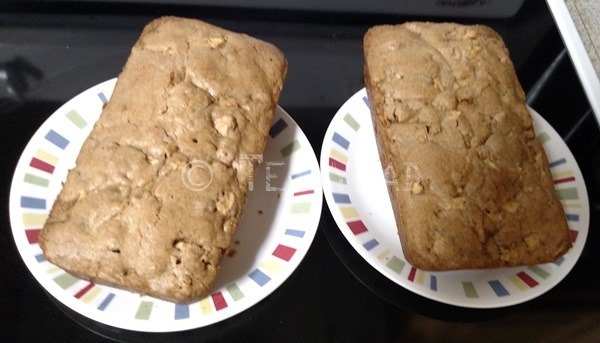 The apple bread was just as good as the muffins with the added bonus of being simpler to make. I didn’t need to measure out individual muffin cups of batter, I just dumped the batter into two loaf pans. The only downside was that individual muffin cups makes for easy portioning. With the apple bread behind me, I began to get ambitious. I was going to make an apple pie. Sure, it was using a store bought, frozen pie crust, but that’s ambitious for me. 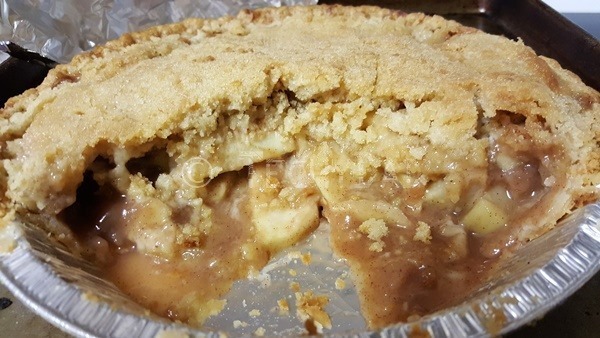 B found a recipe that has a crumble topping instead of a pie crust top. The pie began pretty well. It used up five whole apples! 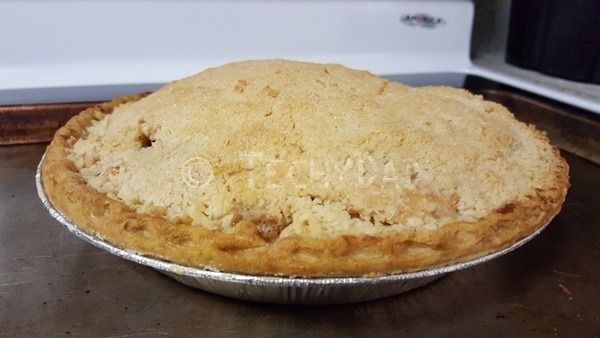 The apple mixture was done and placed in the pie crust. Then, I worked on the crumble topping. 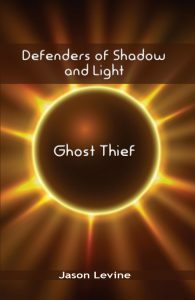 At first, it seemed that something went horribly wrong. It just didn’t look right to me. 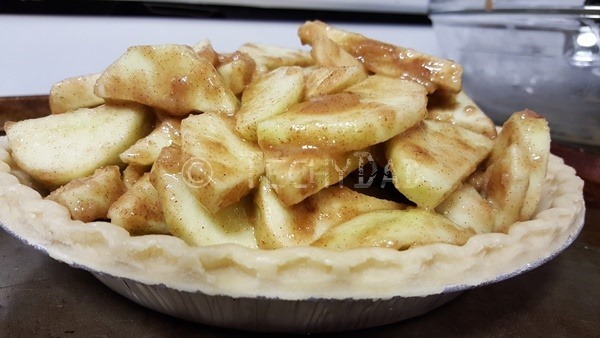 Still, I poured the topping over the apples and placed it in the oven. Boy was I wrong about that topping. The pie came out looking and smelling amazing. After it cooled down a bit, I sliced into it and let out and audible "oooh." This pie kept looking better and better. Next up was a fish dinner I had planned without any side dishes. I suddenly realized I should make something using apples. A quick recipe search and I had something to try. Sauteed apples with brown sugar, nutmeg, and cinnamon. 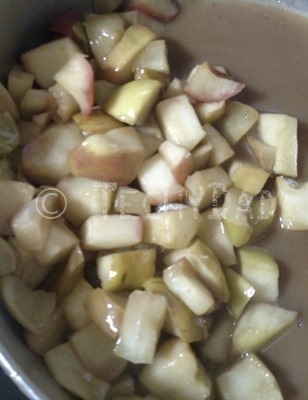 This recipe used six apples and cooked quickly in one pot. 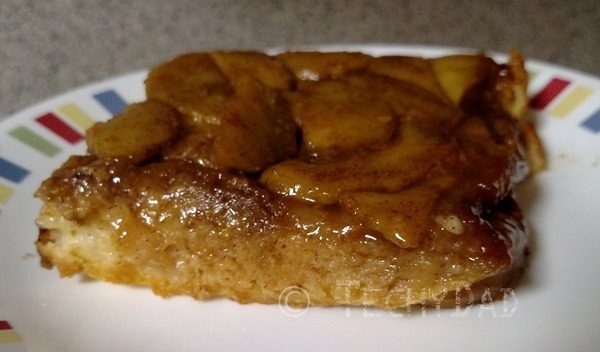 Finally, B wanted me to make an apple french toast casserole. Six apples later, the dish was chilling in the fridge overnight. This was incredible. The only downside here is that I’m attempting to watch my calories and this clocked in at a diet busting 1,000 calories per serving! As much as these recipes used up, our fridge is still packed with apples. It looks like I’ll still be on the hunt for more dishes that include apples. What are your favorite apple recipes? The more apples they use up, the better.